Out of stock since Wednesday, 16 January 2019. Due back soon. Out of stock since Thursday, 20 December 2018. Due back soon. We all know that a dog is not just for Christmas and neither is this fantastic winter dog crew-neck jumper, ideal for wearing right now and will still look the part on Christmas day. Two button collar design with a Yummy! motif. It's fun, it's warm, it's stylish and can be worn right through the Winter months. Comes packaged, complete with hanger and Christmas card swing ticket. Size and washing instructions can be found on the inside of the jumper. Available in sizes to fit the smallest dog, right up to a large labrador. 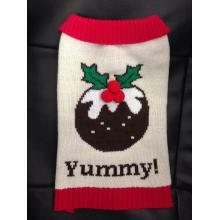 A perfect Christmas Gift for your pet - their very own Christmas Dog Jumper. Comes in a range of sizes from 8"-26"
There are currently no questions for Xmas Pudding Jumper - be the first to ask one!